If you've been to Walt Disney World many times (as many of you have), chance are you have a few go-to spots for more "out of the way" entertainment. Sometimes you just want to escape the crowds for a few minutes and relax in a setting that so many overlook entirely. 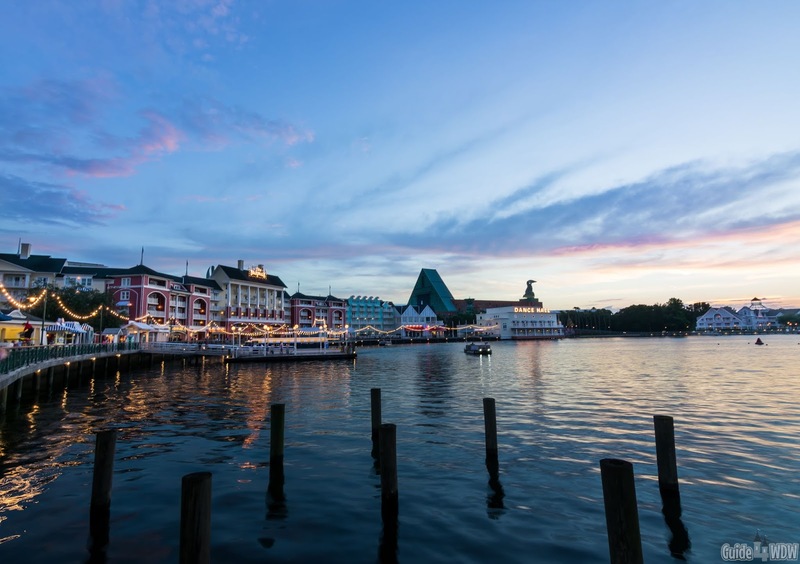 In my opinion one of the very best options for things to do to get that feeling of "relaxation" is to find a comfortable spot and enjoy a sunset over one of the many iconic landmarks across Walt Disney World property. I know for many guests that are not die hard Disney parks fans this sounds like a waste of time when your time in the parks is already so limited. Here's the thing, the few minutes you spend relaxing and taking in the view will likely be one of the most memorable moments you'll share with family. I do recognize that this would be rather tough with young kids, but at the same time it is a great way to grab a snack, enjoy the views, and recharge for your night exploring the parks. As crazy as it sounds, to me there's just something different about a Florida sky. The daytime skies are almost always picture perfect blue at some point throughout the day, but as the sun starts to fade over the horizon (especially in the summer months) the reflection of light off of the clouds and the colors produced high above are something that at times seem like an impossibility. You can grab a bench, sit there looking at the sky, listening to the sounds around you in the parks, and for the briefest of moments let the worries of life fade away. Of course, no article I post would ever be complete without sharing a few spots I consider hidden gems! So, here's what I came up with and a quick look at why I see these as some of the top spots to catch a sunset in or around the parks. There is only one location I can put higher on my personal "favorites" list than this spot and for good reason (we'll get to my top spot below). 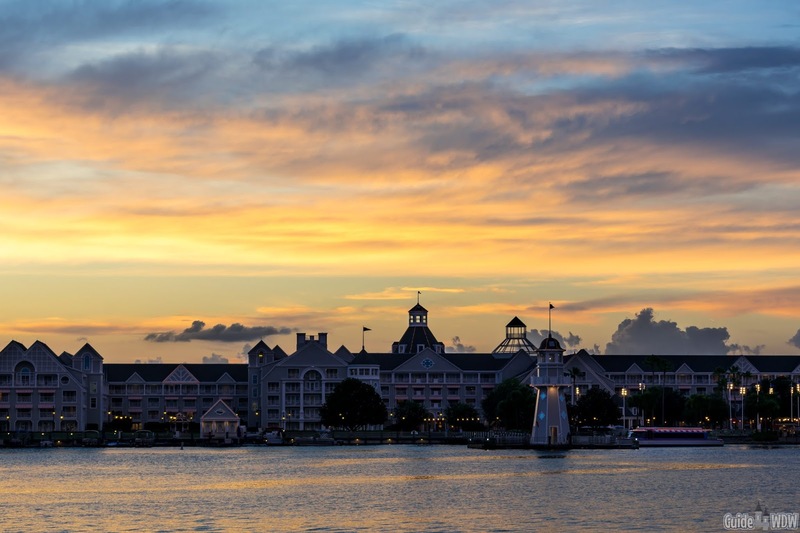 The Boardwalk Resort and Crescent Lake resort area as a whole lends itself to the most perfect unveiling of colors you'll find on Disney property. Obviously it's the same sunset you'll find anywhere else around Disney, but there's just something a touch different about viewing it from this location. As the sun slips out of sight, the lights of the Boardwalk turn on, the off white color of the resort and surrounding resorts reflect the colors, and the water of the lake expertly showcases the colors presented in the sky above. The combination is hard to put into words but is so vastly simple while extraordinary to experience first hand. Grab a slice of pizza from the pizza window, plant yourself in a chair by the railing near the water, and just take in the colors as the slight breeze rolls off of the water, the friendship boats pass by, and the performers start their shows! It's a night worth remembering and the photos below really do it no justice. Believe it or not, these two photos were from the exact same night, and the exact same spot just minutes apart! If you've ever been to the Contemporary to watch the fireworks from a new perspective, you likely already know this spot and why it is on our list. The fireworks observation deck of the Grand Concourse of the Contemporary is a great place to catch a few unique views of the fireworks, but the real bonus is a few flights of stairs up the tower. A few weeks ago I shared a couple photos from this spot and received tons questions about how I got the angle and so on and so forth. Well, here's the answer to that question. If you go out to the observation deck of the Grand Concourse, on the far right hand side you'll find a staircase just past the bridge over to Bay Lake Tower. If you head up that staircase two or more flights, you end up with a virtually unobstructed view of Magic Kingdom and Happily Ever After in the distance. However, if you pick your spot early enough, you can view the sunset in an incredibly unique way that may exceed your wildest expectations. As day turns into night, the light falls over Magic Kingdom and the lights of attractions flip on for the night time festivities. It's a view of things as they happen that you may or may not have ever paid attention to. The castle prominently sits in the distance and from this angle you can really appreciate the layout of the park. Inside the park, everything feels so distant and separated by theming but outside the park looking in from many stories up perspective really starts to change and it becomes apparent how close some attractions are to each other. It's weird to think about, but couple the new perspective with Monorails slowly entering and leaving the tower below you and the audible sounds of the experience and you may be surprised at how much you enjoy this seemingly simple moment. Without a single doubt, this is my favorite place to catch a sunset on Disney property. I know I talk a lot about reflections here on the site from time to time, but they set the scene better than just about anything else. Water, in this case is a show stopping piece of the scene as it unfolds before your very eyes. 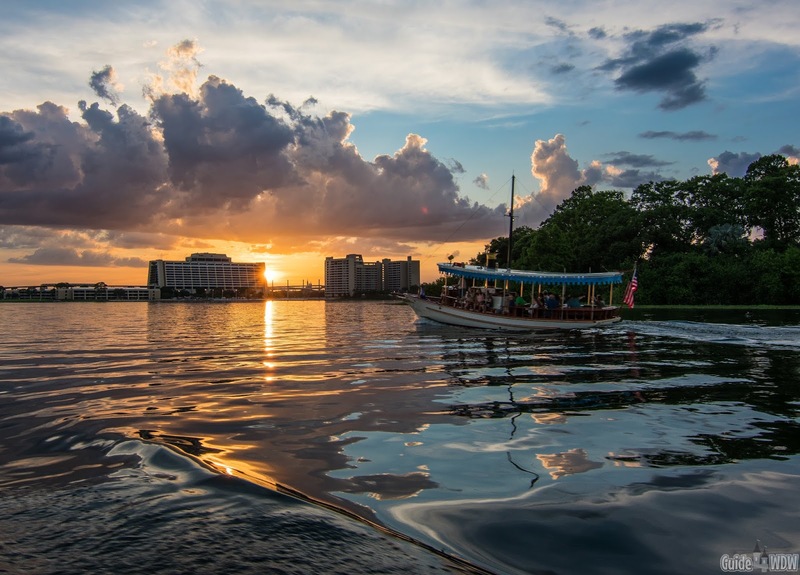 Honestly, there's nothing I'd rather do than ride around Bay Lake on one of the open sided boats at sunset. The experience is truly perfect and one that I don't believe could ever be replicated anywhere else in the world. At points, as the suns sets, you can catch a glimpse of the Contemporary, Wilderness Lodge, the Castle, Monorails, and so much more simply by turning your head. 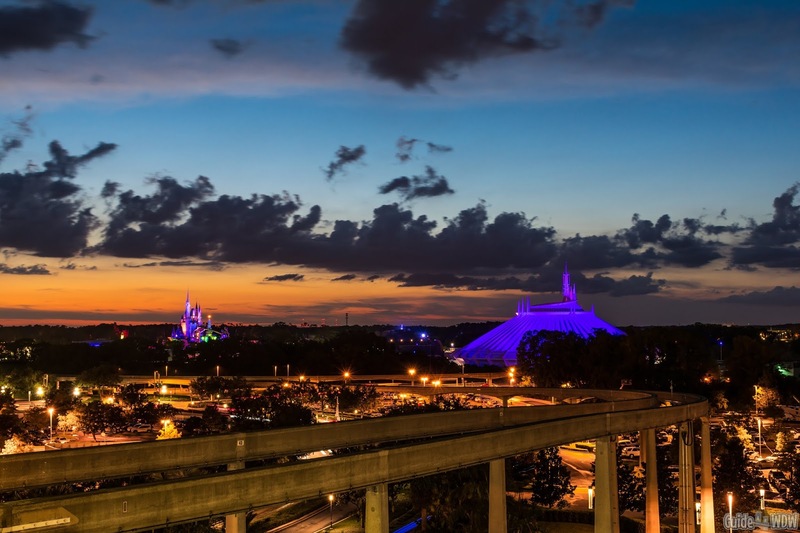 Couple that with the incredibly brilliant colors that can develop in the Florida sky and you have a setting that will exceed your wildest expectations as a Disney fan. The breeze keeps you cool on even the warmest of days, the views are honestly second to none, and your end destination could be the fireworks viewing spot mentioned above at the Contemporary Resort. The photo below was even taken on the same night as the images from the Contemporary above! Last, but certainly not least, we have Pandora. Pandora is a surprisingly unique place to catch a sunset. Inevitably, it will be the busiest spot on this list by a good margin, but the atmosphere and theming lends it to some of the most unique views you'll find on Disney property. The shadows fall over the floating mountains and the light creates a rather unique glow to the land before day transitions to night and the area "comes alive" after the sun fades away. The experience here isn't all about the views or the colors portrayed in the sky but rather about the sounds and moments that surprise you. For lack of a better word, the land feels more alive and sounds more alive as the night draws closer. You can hear it in the bushes around you and you feel like you've really entered a place far from earth on an entirely different planet. You don't know quite what to expect and no matter how many times you visit this space there's always something new to notice that you overlooked on your last trip into the land. You see, when it comes right down to it, a Disney sunset isn't about that perfect view of Cinderellas Castle or even the incredibly vivid colors in the sky, but more about the moments you get to share with those around you. At this point I probably sound like a broken record but to me a Disney vacation isn't measured by what attractions you get to ride or even the shows you get to witness, but rather those little moments with family or friends that you never expected to occur. Those moments are the ones that are most memorable years down the road and those are the moments we talk about day after day. It's not about the place, it's about the people. Truthfully, if I had to give you one piece of advice for your next Disney vacation it would be to enjoy the little moments that seem so trivial at the time. A moment relaxing on a bench watching the sunset, a boat ride to the Magic Kingdom, or even something as simple as going to fill a refillable mug at your resort can create a memory that you never expected and a story that you'll share with family and friends for years to come.